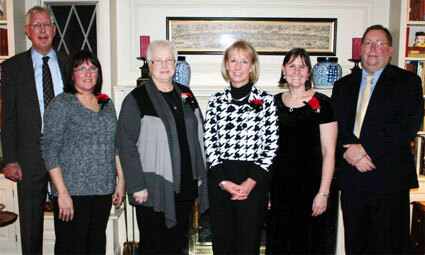 CAPTION: The 2012 Teacher of the Year winner and nominees were recognized at this year's CEF benefit. Shown here: CEF Board President Ed Douglas; Nominees Brooke Wolf and Ashley Hawkins; Teacher of the Year winner Tim Riekena; nominees Leda Schreiner, Tiffany Acree, and Angela Peterson; and R-2 Superintendent Dr. Roger Barnes. The Chillicothe Education Foundation raised between $15,000 and $20,000 at its annual benefit dinner, held at the home of Ed Milbank (CEF Board Director). "That [dollar amount is] pretty normal," said CEF Board President Ed Douglas. The dinner has been held at Milbank's home for the past 15 years. "He also very graciously provides all of the food and drink that makes all of this possible," Douglas said. Douglas noted that the amount raised annually at the CEF-Milbank benefit makes up the Foundation's core funding. He provided that approximately $10,000 is spent annually on the Teacher of the Year awards, $1,500 on the Beacon Awards, close to $2,500 on teacher recruitment, and $3,500 on teacher mini-grants. In further explaining the teacher recruitment moneys, Douglas said that sometimes, if a worthwhile applicant is being pursued within a pool of candidates for an open position within the district, the education foundation might chip in a small cash bonus to reinforce the applicant's incentive to become a part of the R-2 family. "Sometimes, that little gesture can be what it takes," he said. Douglas said that among the foundation's recent achievements were the buying of the 60 acres of land near the Chillicothe High School for possible future district consolidation, as well as taking the lead on the coordination of the new stadium project. "We've had several towns call and ask how our education foundation works," he said. During Wednesday's festivities, he mentioned Cameron as one of those entities. Just prior to the evening meal, the group gathered for a few moments to recognize this year's Chillicothe R-2 Teacher of the Year and Beacon Award (support staff) nominees and winners. BEACON AWARD: Carla Meyers, Career Independence / Career Options Aide and Job Coach at the Grand River Technical School, was recognized as this year's Beacon Award winner. Fellow candidates Mary Lou Wilhoit (CHS and CACE), Janet Abbey (CMS), Amy Hand (Central and BMP), Melody Munson (Field), and Connie Quigley (Dewey and Garrison) were also recognized. Hand and Quigley were absent from the event. CAPTION: The 2012 Beacon Award winner and nominees were recognized at Wednesday's CEF benefit. nominees Janet Abbey, Mary Lou Wilhoit, and Melody Munson; and R-2 Superintendent Dr. Roger Barnes. TOTY: Tim Riekena, Chillicothe Middle School sixth-grade mathematics teacher, was recognized as this year's Chillicothe R-2 Teacher of the Year. 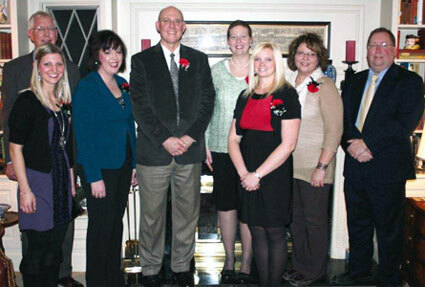 Douglas noted that Riekena and his wife, Tami, are only the second husband-wife duo to win the R-2 Teacher of the Year award, behind Dave and Debbie Goodwin. This year's nominees included: Riekena; Leda Schreiner, representing the Grand River Technical School; Angela Peterson, representing the Chillicothe High School and CACE; Ashley Hawkins, representing Central School and the Behavioral Management Program; Tiffany Acree, representing Field School; and Brooke Wolf, representing Dewey School and Garrison. All were in attendance on Wednesday. The winners of this year's awards were first announced at an assembly at Gary Dickinson Performing Arts Center, on Dec. 7. The Chillicothe Education Foundation Board consists of: Ed Douglas, President; Mike Turner, Treasurer; Julie McCoy, Director; Dr. Roger Barnes, Superintendent; Ron and Roger Wolf, Co-Directors, Grand River Technical School; Mary Staton, Director; Edward P. Milbank, Director; Brenda Fellhoelter, Secretary; Dr. Bruce Brodmerkle, Director; Lindy Chapman, Director; Robin Westphal, Ad Hoc School Board member; and Inger Young, Director. CAPTION: Chillicothe Middle School sixth-grade mathematics teacher Tim Riekena (right), a 29-year employee of the Chillicothe R-2 School District, was awarded the 2012 Chillicothe R-2 Teacher of the Year award by the Chillicothe Education Foundation on Friday afternoon, December 7, at an assembly within the Gary Dickinson Performing Arts Center. 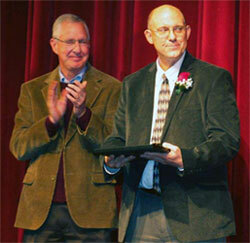 After 32 years of teaching (29 within the Chillicothe R-2 School District), on Friday afternoon (Dec. 7), Chillicothe Middle School mathematics teacher Tim Riekena was recognized as the district's 2012 Teacher of the Year at the annual teacher's recognition banquet held in the Gary Dickinson Performing Arts Center. "Good teaching is what makes good students, and good students make up the future of our community," said Ed Douglas, President of the Chillicothe Education Foundation - the group which sponsors the award each year. "I just like the excitement and surprise of finding out [who wins]." Riekena, a sixth grade math teacher at the Chillicothe Middle School, has been teaching within the Chillicothe school system since 1983-84 and was selected from a pool of six R-2 teachers and teaching assistants, including Leda Schreiner, representing the Grand River Technical School (who was notably absent from the Friday assembly due to illness); Angela Peterson, representing the Chillicothe High School and CACE; Ashley Hawkins, representing Central School and the Behavioral Management Program; Tiffany Acree, representing Field School; and Brooke Wolf, representing Dewey School and Garrison. Riekena was chosen for the award because, as colleagues stated, "He demonstrates a genuine passion for finding the best ways to teach students. He cares about each of his students and the school as a whole. Also, Tim is a model citizen as well as a model educator who daily demonstrates what it takes to teach young people. He is a true gentleman who exhibits high standards and consistency of character. His faith in God, his commitment to family, his superior teaching techniques, and his leadership at school have been key assets for his success. His goal of 'What's Best For Kids' is very evident." Tim enjoys family vacations, camping, bicycling, wood working, reading, and writing. Tim is married to Dewey School First Grade teacher Tami Riekena, and they have three children: Kayla (married to Daniel Leatherman), John (married to Kim Klinginsmith), and Daniel (a junior at Truman State University, Kirksville). He joins wife, Tami, in the ranks of Chillicothe R-2 TotY winners (2007-08 school year), making them only the second husband and wife duo to both receive said award (Debbie and Dave Goodwin). Interestingly enough, both couples had a five-year span between each individual receiving their award (Debbie in 2003-04 and Dave in 2008-09, Tami in 2007-08 and Tim in 2012-13), and, in both instances, the wife received the award prior to her husband. Those nominated for the Chillicothe R-2 TOTY award receive $500 in cash and $1,000 for education supplies, equipment, or professional development. The Teacher of the Year is selected by a panel of judges and receives $1,500 in cash and $1,000 for education items to be used within the classroom, all financed by the CEF. Charles Epps, another CMS math teacher, was selected as the first R-2 Teacher of the Year, back during the 1992-93 school year. 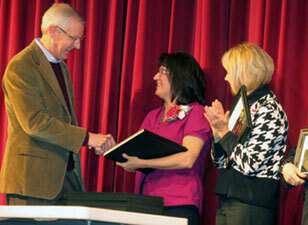 Since then, one teacher has been selected per school year to received the prestigious award. Riekena joins the following group: Charles Epps, Terri Critten, Bill Maupin, Pat Nichols, Nancy Zelmer, Kathy Breeden, Greg Thurmon, Janet Zion, Linda Fox, Marsha Leopard, Jayme Caughron, Debbie Goodwin, Larry Vance, Rosie Smith, Keith Dietzschold, Tami Riekena, Dave Goodwin, Tammy Price, Ellen Gott, and Christine Jones. He is only the seventh male award winner in 21 years. Carla Meyers, Career Independence / Career Options Aide and Job Coach at the Grand River Technical School, was selected as the 2012 Beacon Award winner during the Friday assembly, as the top support staff worker in the R-2 district. This is the sixth year that the award has been handed out. Among this year's candidates were: Meyers (GRTS), Mary Lou Wilhoit (CHS and CACE), Janet Abbey (CMS), Amy Hand (Central and BMP), Melody Munson (Field), and Connie Quigley (Dewey and Garrison). Meyers has worked for the Chillicothe R-2 School District for 14 years. Said the staff at GRTS: "Carla is a very caring person. She gets to know every student in their classroom - their abilities, their needs, their strengths and uncertainties. She is a true beacon: an inspiration. Carla is an important member of Grand River Technical School team. She can be found helping students who need special assistance, teaching job readiness skills, and she always shows compassion for all students." "I could not ask for a more capable, encouraging and motivated aide," commented another anonymous colleague. "The students appreciate her calm and direct approach to assist them in becoming more independent." Carla and her husband, Keith, have three children: Jake and Hannah are both college students, and Nick is a sophomore at CHS. As the 2012-13 winner, Meyers will receive $300 from the Education Foundation. Each nominee receives $100 from the CEF. Gary Eide was the first to receive the Beacon Award during the 2007-08 school year. Ron Rader, Lesa Lee, Rick McCully, and (most recently) Laurinda Davison make up the select group of past award winners. Five Years - Tim Cunningham, Kathy DeBoer, Brandon Dennis, Shelly Falconer, Lance Harvey, Ashley Hawkins, Amanda Marsh, Tim Marsh, Anna McNay, Philip Pohren, Amy Taylor, Gary Jones, Kari Snyder, Brian Peters, and Cecil Samm Jr. Ten Years - Kristi Christy, Terria Cox, Deborah Peery, Sandra Roberts, Jana Shira, Melissa Young, Lori Churchill, and Lisa Wilson. Fifteen Years - Doug French, Ellen Gott, Christine Jones, Joyce Mollohan, Michelle Vinson, Katie Donoho, Darlene Forbess, Terry Mammen, and Beth Willard. Twenty Years - Gracie Bonderer, Kenny Estes, Donna Good, Pamela Swift, Anita Coult, Dana Melton, and Marlene Paulus. Twenty Five Years - Stephanie Baldwin and Brian Thompson. Thirty Years - Pam Gabel, Vickie Garrett, and Tami Riekena. 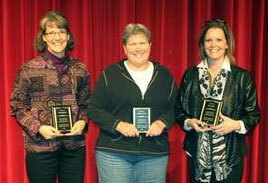 Pictured: 30-year awardees (from left to right) Tami Riekena (First Grade, Dewey School), Vickie Garrett (Physical Education, Chillicothe Middle School), and Pam Gabel (Science, Chillicothe High School).